The Glimpse (Glimpse, #1) by Claire Merle. Publication : June 7th 2012 by Faber & Faber (UK). I received an ARC of The Glimpse to review a couple of months before its release but I couldn't get to it until now. Dystopian novels are one of my favorite kind of books so when Claire contacted me, I was more than happy to accept a copy to review. Ana lives in a society where people are sorted out based on the condition of their health. Illness free people are classified as Pures while those with any form of disease/illness in their DNA are the Crazies and live as outcasts. When she's 16, Ana finds out her life may fall apart because her mother had an illness and there's a possibility of inheriting it since genetics has a lot to do with how a person turns out. The only thing saving her right now from being banished is that she hasn't shown any symptoms of disease yet and Jasper, the boy she's about to be bound to, still wants to be with her despite her situation. I can personally vouch for how incredibly sweet Claire is and I honestly hate writing this review right now. I didn't really have any big expectations from this novel but I do know that I expected more than what I read. It's definitely Claire's writing. Her language and writing style are what made me get through this book. Honestly, I think there was an idea for this book but somewhere that idea was lost or became unclear. 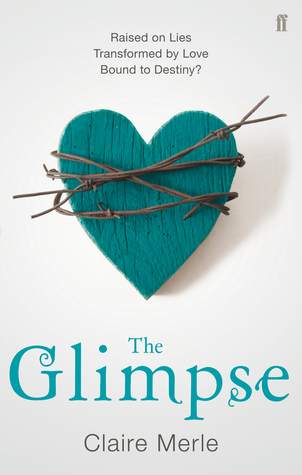 The Glimpse is a novel that tried to have all the common dystopian elements that've worked time and time again but it just wasn't framed right. Usually in dystopia novels, there's one thing that the particular society stands out for like maybe because they control your life, your marriage, choices etc or they have a specific system that everyone goes through during their adolescence but in this book, there's both and it could've worked but I felt that both the elements didn't receive the attention/importance that it should have, which ended up making the story fall short. The characters did nothing for me; Ana wasn't a protagonist that I could relate to, sympathize with or even like. Also, the world building and character development weren't planned out completely because of which the story didn't flow smoothly. I felt like the chapters/pages were broken and there were details that should've been there but were missing. To be frank, I didn't understand what was going on a lot of times; one minute they were talking about something and then the story jumped to something else all of a sudden. To put it simply, it lacked direction. I'm usually picky about what I like but as a blogger, I've learned to alter my expectations to a more realistic level and not compare each novel I read to another that I loved from the same genre. Like I said, while The Glimpse certainly didn't fall short on the writing, it lacked direction. It was the story itself that I had a problem with because I felt that the chapters weren't well thought out. However, I do know a lot of people who actually liked this book so although it wasn't for me, there may be some who may enjoy it. I agree with every you've said. I do think the plot was slightly lost and unclear. Confusing and very hard to understand at times. eeks. I'm glad I read your review, I will be sure to avoid this book.